A brilliant heart-stopping classic thriller. 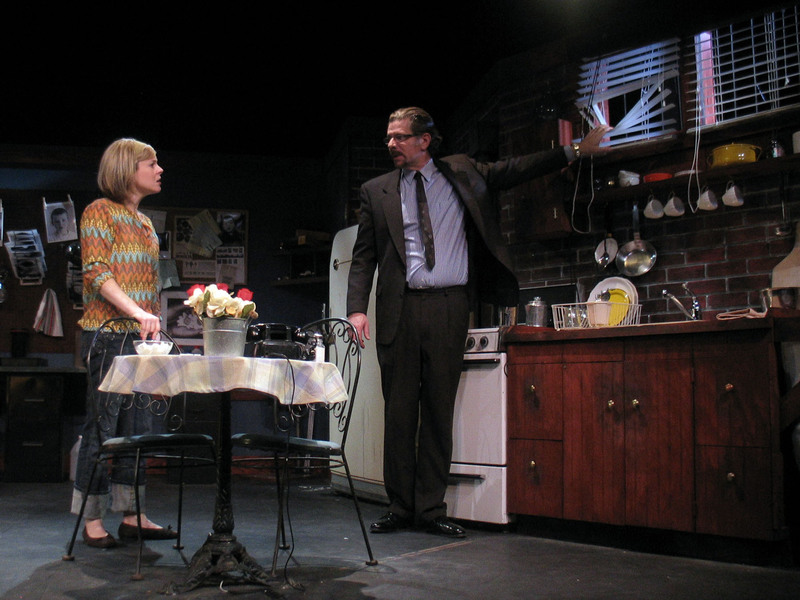 PHIL EBERHARDT (Harry Roat, Jr.) last appeared on the HTC stage as Shelly (the Machine) Levene in the company’s production of GLENGARRY GLEN ROSS. Other shows with the HTC include THE PRICE, NIGHT OF THE IGUANA, ABSURD PERSON SINGULAR, SOCIAL SECURITY, THE LAST NIGHT OF BALLYHOO, LADY WINDERMERE’S FAN and IT’S ONLY A PLAY. Phil holds a BFA in Acting from Boston University. 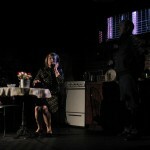 JESSICA ELLWOOD (Susy) makes her seventh appearance with the HTC in this production. 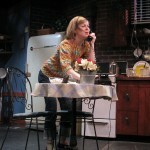 Most recently she played Maureen Kinkaid in last season’s THE OLDEST LIVING GRADUATE. 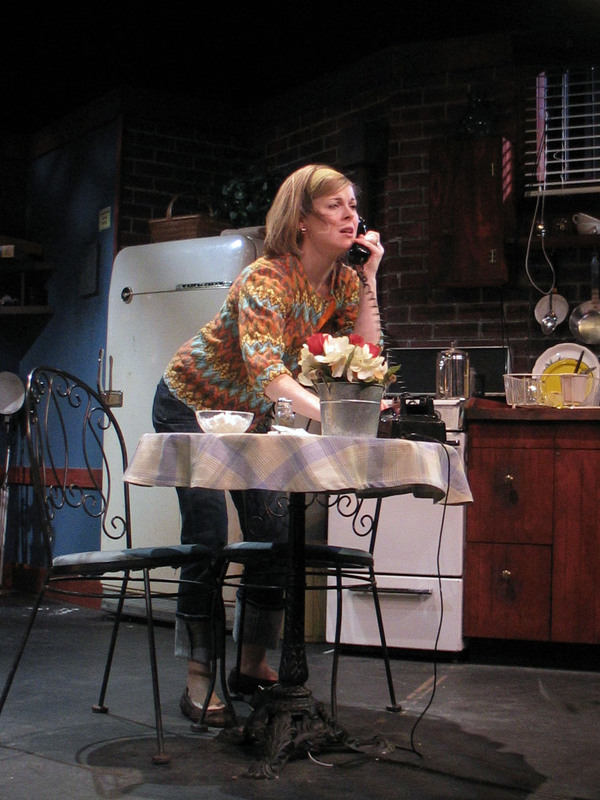 She is thrilled to be back on stage, to be part of this outstanding cast, and to reprise the role of Susy with which she made her Long Island debut at the NFCT. Other favorite roles with the HTC include Jenny in EVERYTHING IN THE GARDEN, Elaine Wheeler in NIGHT WATCH, Claire in PROOF and Nellie in SUMMER AND SMOKE. 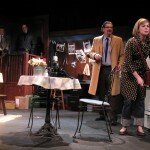 Past productions with the NFCT include THE DINING ROOM and ELEEMOSYNARY. Jessica teaches 8th and 11th grade English, is co-director of the Southold Drama Club, and is the proud mother of her 2-year-old daughter Jamie. EDWARD KASSAR (Mike Talman) played Ricky Roma in the HTC’s production last season of GLENGARRY GLEN ROSS as well as Mike in BREAKING LEGS, Lennie in OF MICE AND MEN and Limping Man in FUDDY MEERS. Other theatrical credits include THE ZOO STORY, ART, MISERY, HURLYBURLY, GOOSE AND TOMTOM, A STREETCAR NAMED DESIRE, SAME TIME NEXT YEAR, I HATE HAMLET, BURIED CHILD, NOT ABOUT NIGHTINGALES, THE NERD, JOE TURNER’S COME AND GONE, THE BALCONY and LA RONDE. Film credits include “Unlikely Prophets,” “Dying for Dollars,” “Overdrive,” “Mook,” “Sushi Bar,” “Mulligan Farm,” “Down Clown,” “Nine Out of Ten,” “If I Only Knew” and “Scallop Pond.” Thanks to Mom, Dad, family and friends for their support. JAMES MACALUSO (Policeman). Exactly 20 years ago, James made his first stage appearance, on the spur of the moment, at the NFCT, in STALAG 17. 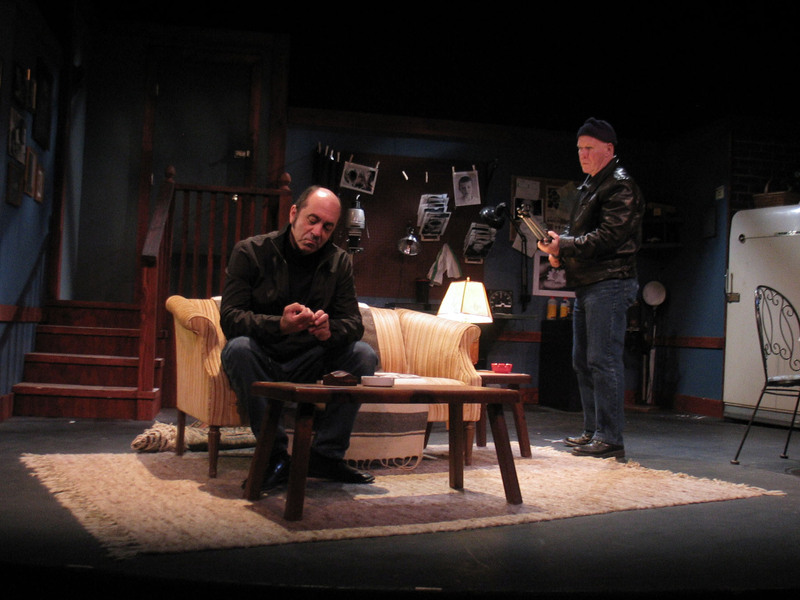 Today a lucky coincidence lands him on the HTC stage where he last appeared as Sam Hoke in the company’s 2005 production of another thriller, NIGHT WATCH. SEAN MARBURY (Sam)’s previous appearances with the HTC include THE FOREIGNER, COASTAL DISTURBANCES and NIGHT OF THE IGUANA, after which he moved to NYC to work in textile design. His other pursuits include song writing, designing race car parts, and film and theater set design and construction. He currently works as a construction project manager on the East End. ROBERT SEAN MILLER (Sgt. 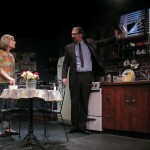 Carlino) played John Williamson in the HTC’s production of GLENGARRY GLEN ROSS. Other roles, both in NYC and on Long Island, include AND ONCE THERE WAS A WAR (Off Broadway), THE WOUND AND THE BOW, MUCH ADO ABOUT NOTHING, AMADEUS, ART, WEST SIDE STORY and MISTER ROBERTS. His film credits include “School of Rock,” “Some Trouble of a Serious Nature,” “Donnie Brasco,” “Night Falls on Manhattan,” as well as stunt work in “Rounders,” “Independence Day” and a Tucker Carlson promo. Robert is also an award-winning filmmaker and playwright. BAILEY MOCKLER (Gloria) is 12 years old. She is in the 7th grade at Westhampton Beach Middle School. Bailey is an avid dancer. She is on the competition team and dances for Royalenova in Center Moriches where she excels in ballet, jazz, hip-hop, modern, lyrical and musical theater. Bailey is a National Dance Champion winning numerous awards for her dance in her solo dance acts, as well as group numbers with her dance peers. BILLY PATERSON (Policeman) has been an actor for more than 25 years and has been on stage in Los Angeles, New York City and most of the East End theaters. 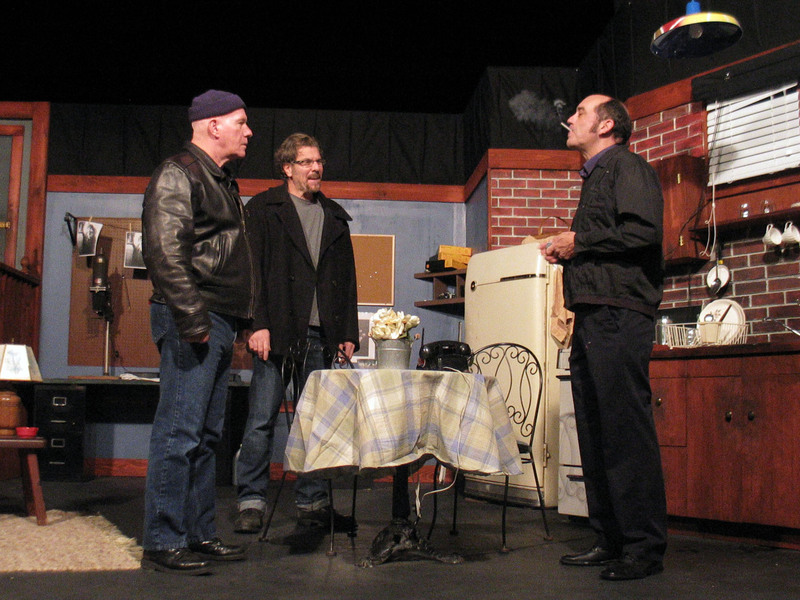 Billy last appeared here at HTC in GLENGARRY GLEN ROSS and is happy to be back with this very professional and distinguished company. FREDERICK KNOTT (Playwright) is best known for DIAL M FOR MURDER which originated as a television production for the BBC before debuting on the London stage in 1952, moving on to Broadway and being made into a Hollywood film (for which he also wrote the screenplay) directed by Alfred Hitchcock in 1954. He also wrote the stage thriller WRITE ME A MURDER, which was produced on Broadway in 1961, and WAIT UNTIL DARK (1966) which had a successful run on Broadway and in London’s West End before being made into a movie starring Audrey Hepburn as Susy. 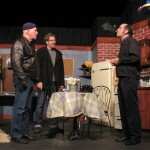 BOB KAPLAN (Director) enjoys acting and directing. Each presents different challenges; both are invigorating and humbling. He’s acted in THE PRICE (here at HTC), EARLY ONE EVENING AT THE RAINBOW BAR AND GRILL, I HATE HAMLET, LAUGHTER ON THE 23RD FLOOR and THE HEIDI CHRONICLES. 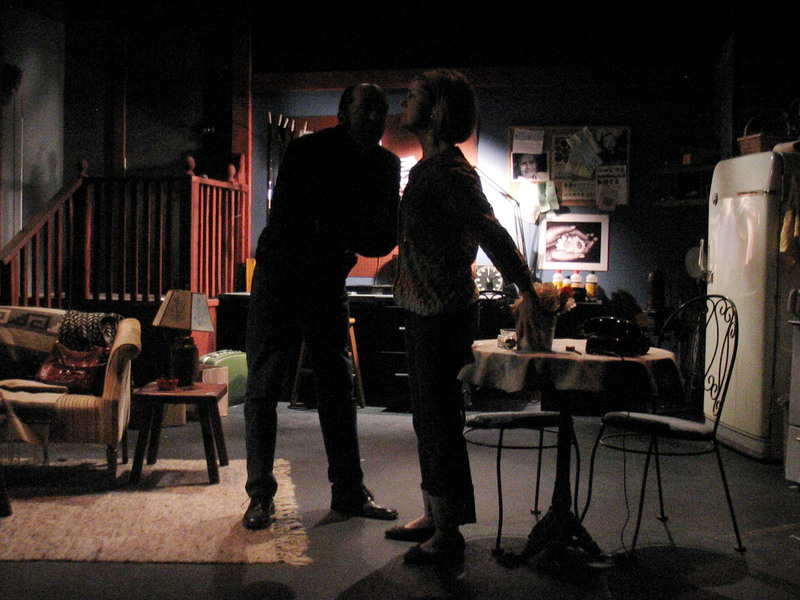 He has directed GLENGARRY GLEN ROSS (here last season), SYLVIA, FOREVER PLAID, PLAZA SUITE, SOCIAL SECURITY and MAN OF LA MANCHA. He also works with the Teeny Awards, a program that supports high school theater by presenting awards each year to deserving students. Thanks to his wife Betsy for being his most insightful critic and for continuing to understand his need to be involved in theater. JOHN ZALESKI (Stage Manager). 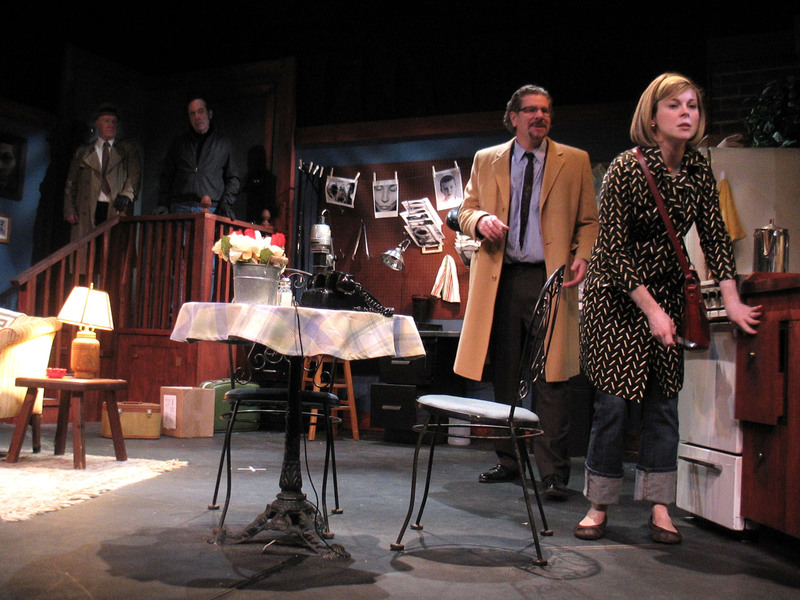 WAIT UNTIL DARK was John’s second involvement with theater some twenty years ago, running props and learning that “you can’t trip over sight lines.” Now, over 800 performances and 2,000 rehearsals later, WAIT UNTIL DARK here in Quogue with the Hampton Theatre Company marks John’s 100th production. He would like to thank the 100 casts, the 100 crews and all who helped make this journey possible, exciting, nourishing and memorable. It has truly been a pleasure, and foremost an honor, reserved for a very fortunate few. Suspense and surprise are the major tools of the mystery writer’s trade, and playwright and screenplay and television writer Frederick Knott learned his craft well, if economically. Actually, in a long career of writing television scripts, he had two major achievements in writing for the stage, both of them mystery thrillers: “Dial M for Murder” and “Wait until Dark.” Both spin their wheels in the first act, setting up complicated—and in the case of “Wait Until Dark,” fairly unbelievable—plots that climax, in the plays’ closing 10 minutes, in some slambang effects designed to scare the hell out of both the characters onstage and in the audience. 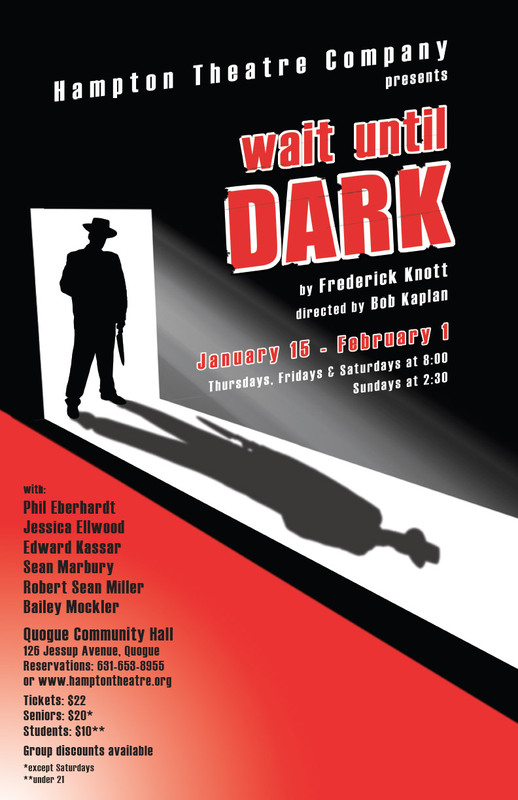 They do this very well indeed, in the current, well acted and realized production in Quogue of “Wait until Dark” by the Hampton Theatre Company. True, the climax isn’t that much of a surprise, but as acted and directed in this production that knows what it’s doing every second of its running time, it’s satisfyingly spooky and gripping. The plot revolves around three gangsters’ frantic search for a heroin stuffed doll unwittingly carried into the U.S. from Canada by Sam Hendrix, a freelance photographer whose new assignment, courtesy of some machinations by the gangsters, keeps him conveniently absent throughout most of the play. This leaves his young, bright and blind wife Susy to bear the brunt of the gangsters’ search. But Susy, for all her handicap, is endlessly resourceful, and her fight for survival, pitted against the gangsters’ attempts to eliminate her in a horrible and painful way, forms the central conflict of the play. Of course, Susy’s blindness gives her the advantage of being able to function in total darkness, and that’s the way the closing moments of the play are played. Director Bob Kaplan keeps the action sizzling, and his ensemble of excellent actors keeps the tension high and the forward motion constant. Peter Marbury’s cluttered depiction of a Greenwich Village basement apartment is both realistic and scary. Sebastian Paczynski’s moody and constantly changing lighting design is a character by itself. And, as usual, Teresa Lebrun’s costumes are perfect. 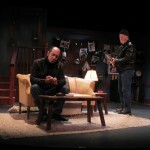 As police officers, James Macaluso and Billy Paterson make the most of their minute and 15 seconds on stage. Sean Marbury, as Susy’s husband Sam, utilizes well his slightly longer moments on stage, including in a mysteriously romantic coda added by the director. Edward Kassar, as the most human of the trio, has some nice moments with Susy, and Robert Sean Miller, as the crooked police sergeant Carlino, is particularly effective as a greed-motivated idiot. Westhampton Beach Middle School student Bailey Mockler, age 12, shoulders the major role of Gloria, an upstairs youngster who does errands for Susy and obviously doesn’t care much for her job, with intelligence and timing. The ringleader of the gang of three is Harry Roat Jr., played with delicious skill by Phil Eberhardt. A cool customer, fazed by nothing in the play’s opening act, he becomes far more menacing and terrifying in the play’s wild and scary closing scene. 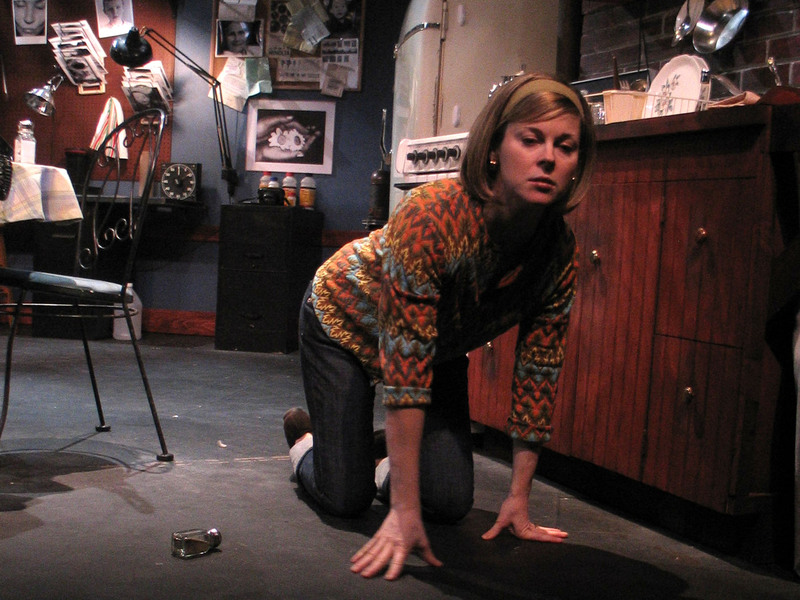 Mr. Eberhardt balances his contrasting selves well and believably, and plays perfectly off Jessica Ellwood, as Susy. Their scenes together are truly fiery. 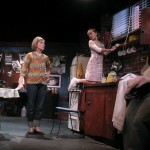 The true star of “Wait until Dark” is the blind Susy, and Ms. Ellwood has had a sizeable relationship with the role. 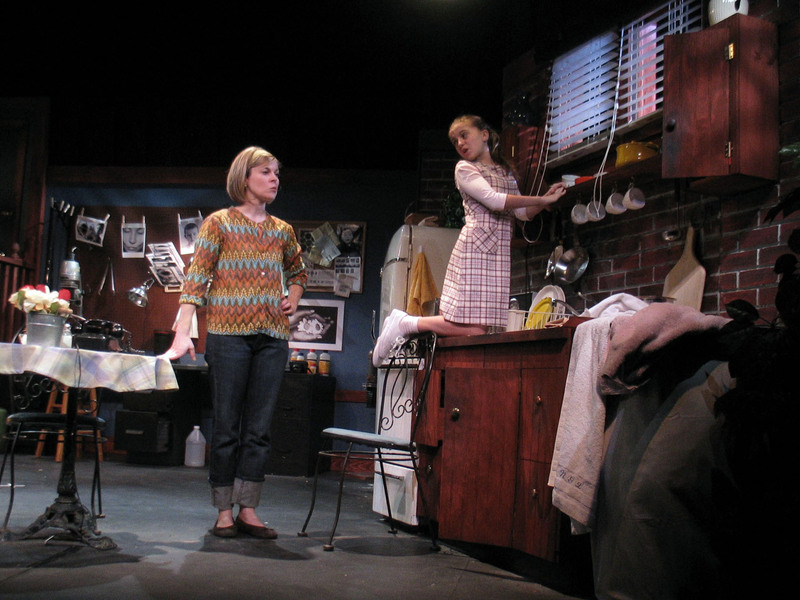 This critic well remembers her debut in the role in a North Fork Community Theater production, also directed by Mr. Kaplan. She was impressive then; she’s stunning in the same role now in Quogue. Working within the levels of the interior of the character of Susy, she manages to convey an entire symphony of emotions and motivations. It’s a performance that can justifiably be described as awesome. Ms. Ellwood, over the years since she first debuted locally in the role, has grown and deepened as an actress, and this is her finest performance yet. 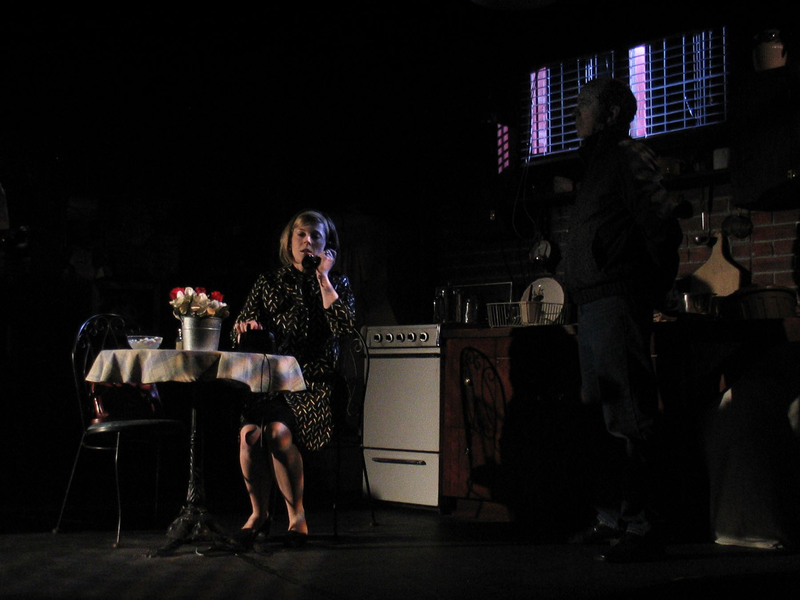 There won’t be much to occupy your mind at “Wait Until Dark,” but that’s as it should be in a murder mystery that seeks only visceral effect. There’s plenty of this in this well executed production of a 47-year-old chestnut that still retains its flavor.